Redress for the Chinese head tax and Exclusion Act became an election issue that surprised many. The Chinese-language media, which operates four main dailies serving a majority of recent immigrants in the 1.3 million-strong community, constantly raised the issue with candidates. In an exclusive interview with Prime Minister Paul Martin on Dec. 5, 2005, radio broadcaster and talk show host Simon Li doggedly asked the Prime Minister why he would not directly apologize to Chinese Canadians for more than 60 years of legislated racism against Chinese. Meanwhile, activists developed a cross-country media strategy to garner support from all Canadians for an apology and redress, based on Canada’s multiculturalism values and human rights track record. The Internet provided an opportunity to communicate with other ethno-cultural communities and the mainstream English- and French-language media to spread messaging about the issue. On Jan. 23, 2006, Canadians elected a minority Tory government under Prime Minister Stephen Harper, who moved quickly to resolve his promise of an apology and redress. He repeated his pledge and even included mention of it in the Throne Speech. Harper instructed his government to hold cross-country consultations with Chinese Canadians, and again heard the heart-wrenching stories of the aging head tax payers, their spouses and their families. Heritage Minister Bev Oda, who had sat on the Standing Committee on Heritage in the previous Parliament (and had supported Bill C-333), and Parliamentary Secretary to the Prime Minister for Multiculturalism Jason Kenney held consultations with Chinese Canadians in major cities across Canada. The community responded by telling its stories. A search began for aging head tax payers and their surviving spouses, who by simple arithmetic would have been in their mid 80s or older by then. The government continued its consultations, trying to appease the NCCC and re-engage the CCNC, which demanded financial compensation as part of any redress package. 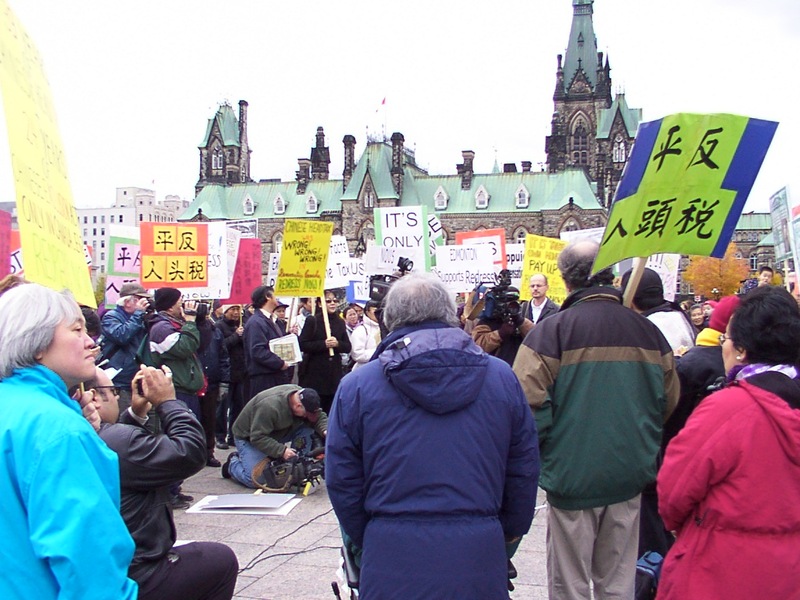 While there were some differing views on the amount of compensation and which classes of claimants should be paid, there was general agreement on the requirement that Parliament apologize to Chinese Canadians.